Everything can be taken away from a man but one thing: the last of the human freedom -- to choose one's attitude in any given set of circumstances, to choose one's own way. 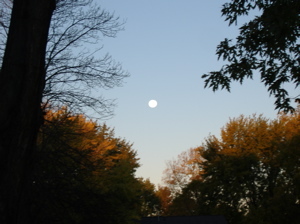 Looking up at an early morning autumn moon in De Pere, Wisconsin. Dr. Viktor E. Frankl spent nearly three years in Nazi concentration camps where his wife and parents were executed. He and his sister were the only survivors in his family. He faced horrors I couldn’t begin to describe or even imagine. An educated man with hopes and dreams to pursue a life of success, he found himself treated like an animal facing the possibility of torture, execution or starvation at any moment. Literally stripped of every material possession he owned, he watched friends, family and strangers die: some to execution and others perished after losing their will to live. Yet, while control of his physical life was completely taken from him, he maintained the will to live with purpose and intention. He had no choice; he knew that given the circumstances under which he was forced to live, if he lost his will, he would die, and without a second thought, his body would be tossed onto a pile of other corpses in a ditch. Traffic, a sleepless toddler, money management problems and a messy house pail in comparison to the challenges faced by Frankl. Yet, I find myself focusing with frustration on these issues from time to time. How could Frankl find peace while suffering with starvation, grief and unimaginable abuse while I, with my warm, comfortable and safe home, beautiful family, secure and rewarding career and freedom, struggle to find peace? It is a matter of choice. When I focus on and express gratitude, I find peace and incredible joy. It really is that simple; however, it is not necessarily easy. It takes practice and persistence: a constant consciousness of my attitude. With practice, I am able to catch myself when life’s demands frustrate me and remember the gifts I have today. I look for opportunities to express and share my gratitude for what I have. This website is one such opportunity for me. When I find myself questioning my ability to pursue my purpose in life because the demands in my life make it difficult for me to focus on my goals, I remind myself that, Frankl, after having survived inconceivable horror, survived and lived on to be an inspiration to millions. Take some time to focus on the gifts in your life: family and friends, health, your home, your car. Although there may be imperfections, focus on the things that are pleasing to you and allow yourself to feel a sense of gratitude: even if just for a moment. Take a mental snapshot of that feeling and of the things that you focus on, consider writing them down. Bring yourself back there whenever you begin to find yourself frustrated or unsatisfied. Remember what Frankl experienced and be grateful that you can learn from his experiences without having to live through them. And, as he did, look for opportunities to express gratitude through kindness and actively look for more reasons to be grateful. It really is amazing the things we can take for granted. How soon we forget that people are stripped of their families to go to war, people are dying of starvation, others trying to still pick themselves up from hurricane Katrina .. and I’m complaining about what? Suddenly it seems so small, makes no sense to complain about, and guilt is felt because of self-centeredness. Life is good. It really is a challenge, when you’re in the thick of life to remember how good life is. Thanks for sharing your comments Curt. Last 3yrs have been tough for me, my dad was diagnosed with lung cancer & had operation to remove the tumour, which took 3/4 of a lung away. Then he was diagnosed with an abdominal aortic annuerysm, which was operated on earlier this year. Also he’s had a few very serious, life threatening infections and has been diagnosed with COPD. I have been with him every step of the way, but it hasn’t been easy and it’s been hard to keep dad moving forward instead of allowing the illnesses to defeat him. It’s only hit me this last few months that I view the world with a glass half full, that’s not to say I don’t have days when I empty the glass and don’t refill it. Somewhere along the way I realised that I could chose to let things I cannot change get to me, or I could just let go and take the good from each situation to give me that little boost to be able to give my dad the strength to get through. I think if we accept the bad and find something in it that makes it good then we free ourselves to accept more good into our lives and if we can keep on like that, pretty soon the bad will just be a stepping stone over to the good stuff.